After two and a half years as a sheik’s private yacht sailing out of Abu Dhabi, Dubai and then Genoa, Noble Caledonia’s latest acquisition, the Caledonian Sky, was shown off to the public in London last week. 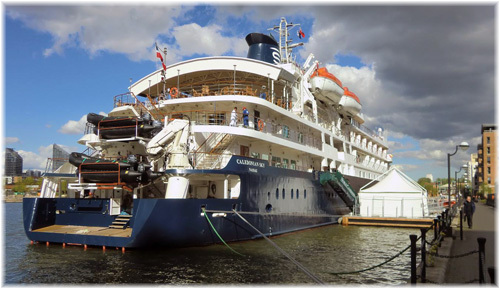 Having undergone conversion back to a cruise ship at Gothenburg over the winter, the former Hebridean Spirit was put on show to Noble Caledonia clients and the trade. 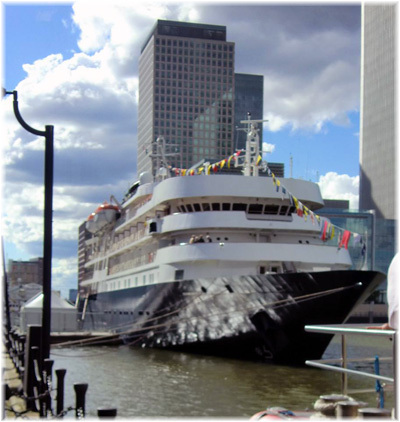 The Cruise Examiner therefore took advantage of the opportunity to have a look at her in London’s West India Docks on Friday. Elsewhere, with some observers quoting the chances of Greece having to leave the euro at 50% to 75%, we speculate as to what that might do to cruising in Greece. Finally, with the christening of Oceania Cruises’ new Riviera in Barcelona on Friday we look at Oceania’s rather successful positioning in the cruise market. Noble Caledonia Ltd proudly showed off its newly-acquired 114-berth small ship Caledonian Sky to the public and the trade last week in London’s Docklands. 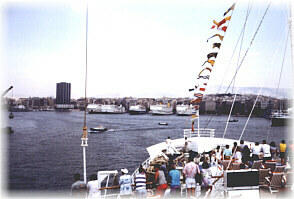 Caledonian Sky joins near sister ship Island Sky, which was chartered by Noble Caledonia in 2004 and acquired in 2010. Taking her name not ony from the operating company, but also from the much-loved 82-guest Caledonian Star, a converted trawler that operated for Noble Caledonia between 1989 and 2001, the Caledonian Sky is sure to be a very popular ship. Built as the Renaissance VI by Nuovi Cantieri Apuana in Italy in 1991 (Island Sky was built by the same builders as Renaissance VII in 1992), the present ship went on to become Sun Viva II and Megastar Capricorn in the Far East before being acquired by Hebridean Island Cruises and renamed Hebridean Spirit in 2001. When that company ran into financial problems in 2009 she was sold for use as a private yacht, as was reported in this column by Mark Tré (“A Few Small Ship Mysteries,” April 20, 2009). As soon as Hebridean had collected the reported sale price of $7 million, that company was placed into administration and ultimately taken over by All Leisure Group. Her new owner in 2009, Sheik Sultan bin Khalifa bin Zayed Al Nahyan, renamed her Sunrise. Sheik Sultan bin Khalifa is adviser to the president of the United Arab Emirates and member of the Executive Council of the Emirate of Abu Dhabi, as well as heading up SBK Holding Company, based in Dubai. As the 26th largest yacht in the world, the Sunrise was based for almost a year in the Middle East, first at Abu Dhabi and then at Dubai, before moving to a new base at Genoa for eighteen months. Last summer, she could be seen at Olbia, La Spezia, Livorno, Portofino, Cannes, St Tropez and Gibraltar as well as at her base in Genoa until Noble Caledonia announced her acquisition last August. As Caledonian Sky, she is now managed, as is Island Sky, by Salen Ship Management of Gothenburg, where she was given her latest refit. One major change was the installation of four large staterooms aft on the Promenade Deck where the Sheik’s suite had been. As reconfigured, she once more accommodates 114 passengers, where as Hebridean Spirit this had been reduced to 90. While striking features such as the wood panelling and brass fixtures remain all soft furnishings and carpets were replaced over the winter. The public areas have also received a complete makeover with new furniture acquired for the main lounge and bar. And a new satellite dish has improved Internet connection, while all passenger cabins now feature Wi-Fi access and flat screen TVs. 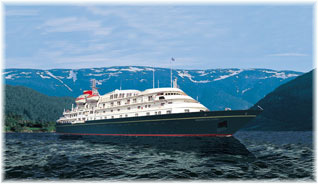 After an initial season in the Atlantic, including vists to Iceland, Greenland, Labrador and the Canadian Maritimes, the Caledonian Sky will be sent to the Eastern Hemisphere, where she will cruise from the Russian Far East and Alaska in the north to Australia and New Zealand in the south, visiting Japan, Indonesia, Papua New Guinea and the islands of the South Pacific. Meanwhile, her maiden voyage will leave Plymouth on May 20 for the Isles of Scilly, Wales, Ireland and Scotland, finishing in Oban on May 30. From Oban she will head for Iceland. Could Greek Cruises Get Cheaper? The newpapers this weekend have been full of warnings that with the political situatuion in Greece and a general Greek unwillingness to adhere to European Union requirements to cut their budget further, Greece will not receive the next installment of its EU bail-out and will fall out of the euro within about eight weeks. So what will happen if Greece leaves the euro and opens up its drachma presses again? For one thing, it will once again be able to devalue its own currency instead of being bound by the “one size fits all” Euro. Such a currency devaluation will make Greek exports cheaper and relieve some of the pressure. But how might it affect cruising? Well, for one thing, there is very little left of the Greek cruising industry. The rump that survives is two Greek-flag ships owned by the Cyprus-based Louis Cruises, which this summer will operate the 966-berth Louis Cristal and 1,450-berth Louis Olympia from Piraeus and a third smaller ship in the Cypriot market. It will all come down to costs in the end. If Louis and others who may wish to look at the Greek flag can keep a high proportion of costs in drachma, for example crew costs, local victualling and port costs, then they may make some progress. Other costs, however, particularly fuel and foreign crew, would remain in dollars so it would all depend how this breaks down. For smaller companies like Variety Cruises, whose costs would be mostly in drachmas and income in euros and dollars, Greece leaving the euro might be more favourable. One certain thing is that a Greek devaulation would be good for its tourist industry, but whether Greek cruise ship costs break down in such a way that would allow this to turn into more cruise bookings remains indefinite. Neverthless, if the tourist business does thrive it should still have an impact on the cruise business and particularly Greek cruise lines in sheer terms of numbers. Even if only a portion of their own costs were in drachma, Greek ships would still be more competive with ships whose costs remain in dollars or in euros. And they would offer a real Greek flavour. 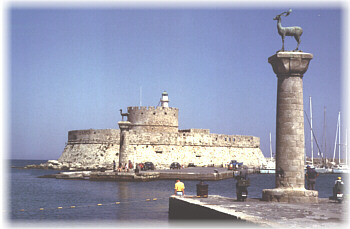 It would also make Greek ports more attractive to all cruise lines if port costs were quoted in drachmas (and port costs not raised again). But let us wait and see how the next few weeks pans out. 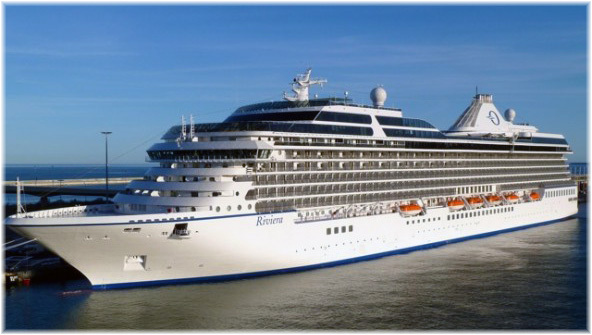 Oceania Cruises’ Riviera, a sister ship of the Marina delivered in January 2011, was christened in Barcelona on Friday. At 66,084 tons, she would have been one of the largest in ther world two decades ago, but is now just a footnote in an age where cruise ships have exceeded 225,000 tons and carry more than 6,000 passengers. In fact, more than 100 cruise ships exceed the size of these two sisters. But those big ships, with all their children’s attractions (and we know that some adults are just grown up children), are much more like fun fairs than the cruise ships we used to know. Riviera and her sister ship, however,are built on a more human scale, retaining their attachment to the sea. They are not like the big ships, travelling engineering marvels. But they are sophisticated. As in days of yore, these ships exude quality on board and offer a quality cruising experience, reminscent of the type of thing New Yorkers used to experience in Home Lines’ Oceanic, the first large purpose-built cruise ship, and Holland America Line’s once Transatlantic liner Rotterdam in the 1960s and 70s, and Brits knew with P&O’s traditional Canberra and Oriana, while both sides shared Cunard Line’s Caronia. Oceania Cruises has furthermore pulled a brilliant coup by positioning their ships as upper premium rather than utra-luxury. 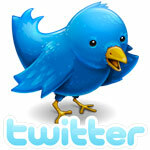 This means that it is easier to exceed passengers’ expectations when the ships’ position in the market is understated. This formula has won the day for Oceania and the proof of it is in the 2012 issue of the Berlitz Complete Guide to Cruising & Cruise Ships. Not only has Marina, the first of the twins, scored highly, achieving a full five stars and 1701 points out of 2000, but she has eclipsed her own supposedly more upmarket stablemates over at Regent Seven Seas Cruises, the all-inclusive arm of Prestige Cruise Holdings. Ironically, I’m sure this is not what Prestige intended but the three Regent ships have been given only four-plus stars and an average of 1633 points out of 2000. The reviews for both of the new ships have been consistently good, with the only criticism being that unlike the traditional cruise ships named above the new sisters have no walkaround promenade deck. However, the new Oceania sisters measure an impressive 52.8 tons per passenger, offering about a third more space per passenger compared to the average of about 40 on most contemporary ships today. The Riviera will offer a total of twenty Mediterranean cruises before heading for her new home port of Miami in November. Meanwhile, with two new ships now delivered to Oceania, it was reported that the top executives from both Prestige Cruise Holdings and the Italian shipbuilders Fincantieri who built the latest pair, were back on board Riviera negotiating the next newbuilding for Regent Seven Seas. And in the UK market, Oceania last week introduced free flights from London.